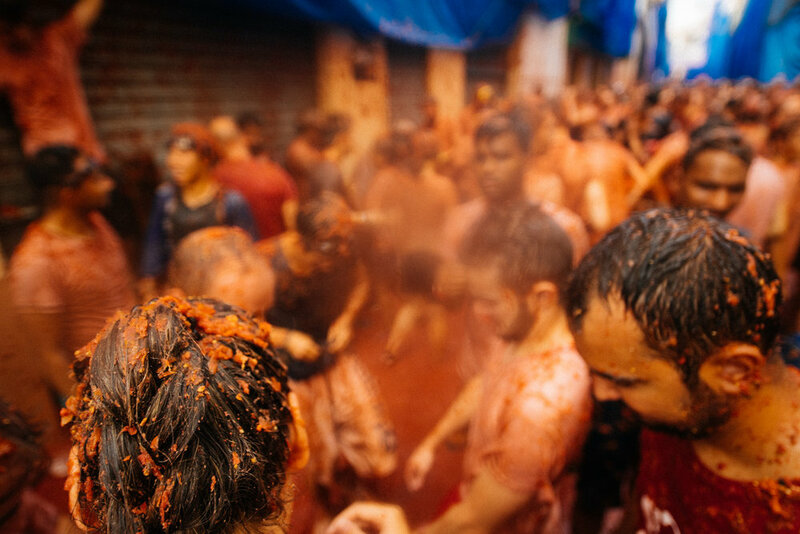 Only 20 miles from Valencia, lies the tiny Spanish village of Buñol, where every year is celebrated a very unique and curious tradition: la Tomatina. Buñol is a quiet little town 355 days of the year. 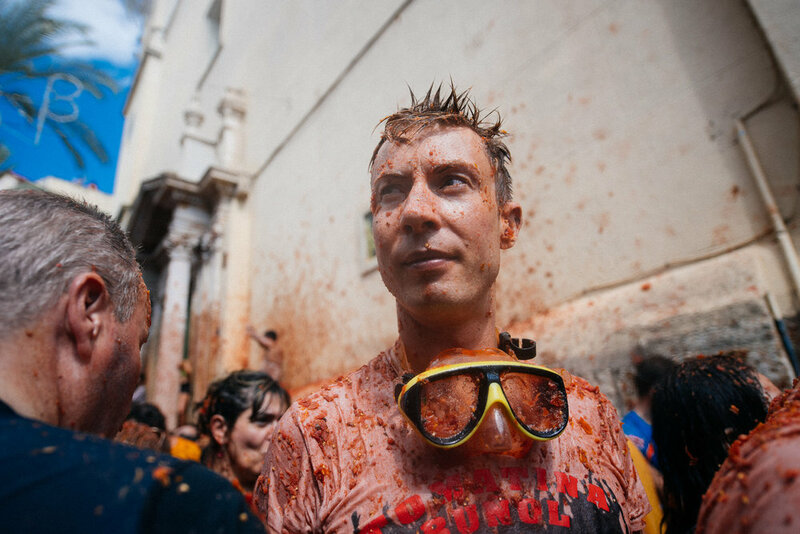 On the day before the Tomatina, the festivities begins with lots of food and some houses already start to protect themselves from was is to come. The medieval city is a typical Spanish pueblo with a castle and everything. Its quiet streets are transformed once a year. It all started in 1945, that we know. There is a bit of controversy on how it started. One legend says there was a guy with a guitar singing loudly in the city’s main plaza. A bunch of kids got together and made him shut up by throwing tomatoes at the poor musician. It happens that the guitarist was quite good and those listening to him ganged up and threw tomatoes back and the kids starting the First Great Tomato War. Another story, more likely according to the faithful Wikipedia, says that a group of youngsters invaded a traditional parade. Those taking part in the parade didn’t like and push went to shove right beside a fruit stand when all hell broke loose. The next year the same guys came back, bringing their own tomatoes. The following years the police intervened and canceled the “festivity”. It finally was reinstated in 1959 with a bunch of new rules like time limits and “you gotta clean up afterwards”. It has happened every year since on the last Wednesday of August. I happened to be there in 2018, and man, it is truly a unique experience. I arrived at 6:50 am and it was already hard to find a place to park. At 7am they close traffic so you better be there early. The whole city stops for this event. Nothing else happens. There is no way to get lost, just follow the bunch of people walking downhill and you’ll find yourself in the frontline. I walk downhill with a mass of people from every country you can think of with the exception of, maybe, Spain. I mean, I’m sure there were Spanish people in the fight, but certainly this has become an international event and locals aren’t as enthusiastic about it. Once I get to the “red zone” at around 9am, after getting my press card, first thing I notice is that most buildings had tomato proofed their walls with huge tarps. I guess it’s not that easy to get rid of red tomato stains (which now I am sure of given the state of my clothes). The place is packed and a group of men in cementing a huge pole with a ham on top in the ground and covering it with grease. As I found out later, the set of rules of 59 said that the fight could only start after someone got the ham. First went the Japanese team. No luck. Then a random drunk dude tried. Oh man, it wasn’t pretty. 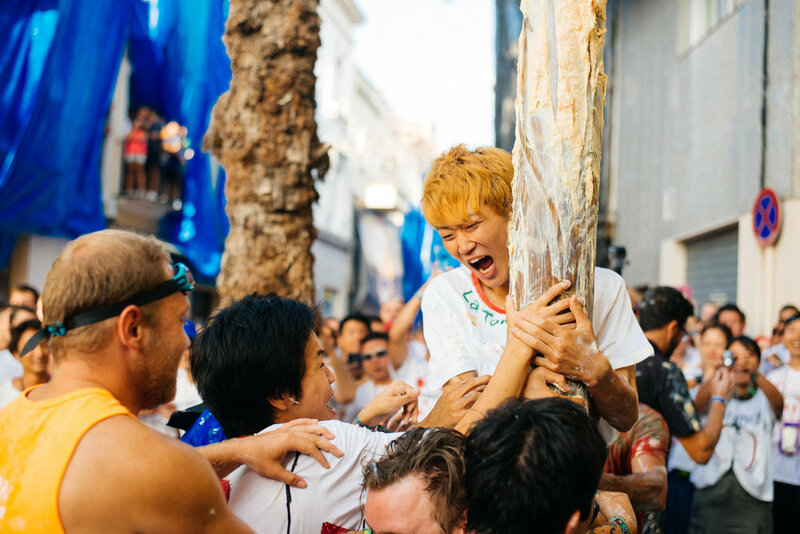 Drunk man in red pulls Japanese man out with a bowtie of the crowd to attempt to climb the greasy pole. Needless to say, he didn't go too far. The Japanese team gets together and try unsuccessfully to climb the palo-jabón, the soap pole. Tomato zombies attempt to climb the pole while Ketchup-man gets a selfie and brings everyone back down. While dozens of people just ran on top of each other like zombies from World War Z climbing that wall, actually getting higher and higher, a group of very strong Indian men were strategizing on how to get the prize. One of them told me they had a similar festivity back home and they new the formations and the ham would be theirs in no time. They just didn’t account on the zombies. It didn’t matter how much they tried, there was always some big heavy zombie that would climb on their back and pull them all down. I’m glad they updated the rule and at 11am the fight starts no matter what. The ham is probably still there, by the way. As soon as the first tomatoes are distributed everyone is already completely red in goo. A loud noise signals the start of the fight and a truck rolls in the street with people throwing ammunition from the back. People frenzy with the red. We’re back to zombies but now Walking Dead style. No, better, like Train to Busan, because these zombies were FAST. The insanity of the battle is indescribable. I was blindly shooting and cleaning my lens as much as I could. Some idiots would wait for me to wipe my lens to immediately throw a tomate straight at it. The main action happens in front of the city church. A few brave soldiers stand up high on the walls and are shot at like a firing squad. On the left of the picture, the ham is still on top of the pole. At this point there were no more full tomatoes. People were throwing juice or whatever they could get their hands on. On the left a plastic cup with crushed up tomatoes spills its contents all over the place. Less than a minute in, I’m working reporting live on Periscope, I get a big fat tomato right in the face. I’ve got my water proof iPhone 7 in one hand and one Nikon camera on each should, which I had tomato proofed the night before. I’ll tell you more about that at the end. It was total madness. I could barely lift my arms. I try to move towards the heavy fighting, but every time a truck came in I got squished back to the wall. There is no way out. I’m shooting blindly on auto ISO with the widest lense I had to ensure things were in focus. Don’t expect to have any mobility. I had prepared myself by taking swimming goggles for the acid, but it just fogs and I couldn’t see a thing, so I ditched them. One can barely see the ground in a sea of tomatoes that can be almost a foot deep. The streets turned into a red river of tomato corpses that were being scooped back up in plastic cups and thrown back at people. I couldn't see much of what I was shooting. There were tomatoes flying everywhere and I was constantly cleaning my lens. This guy looked at me right after I had cleaned my lens to shoot more and was about to throw a bunch of tomato pulp at me. I just look at him "please, no"... and he gave me a pass. Thanks, man. Everyone asks me about the smell. It didn’t stink, but there is this acidity to it. The scent stuck to my nose for like two days. It wasn’t bad, but it definitely wasn’t good. Just as it started, the battle ends. That one hour went by so fast I didn’t even notice. Surviving soldiers bravely retreat after the end of the battle. It's over. It's safe to take of your goggles. 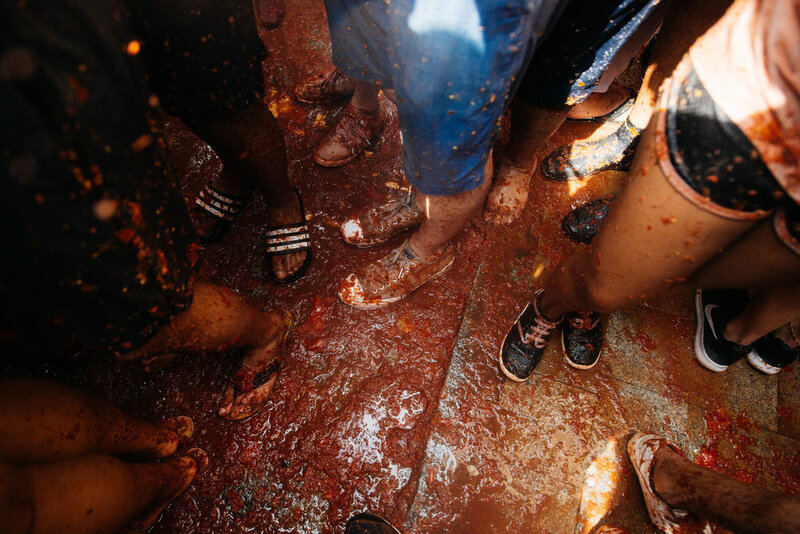 People start pouring out giving space for selfies in the rivers of tomato lava flowing into the gutters as locals tried unsuccessfully to kick tourists out so they could clean up and go back to their normal lives. Some would run and slide face first in the tomato while others would just unsuccessfully attempt to make tomato angels. One man started cleaning his sidewalk the second he heard the explosion. He had a pump and was draining his property while chasing tomato zombies with a broom. Apparently the tomato acid disinfects everything and leaves the city squeaky clean. By the way, the tomatoes used in the fight are improper for human consumption and would be discarded anyways. Selfie time. A couple lies in the tomato river while others throw goo on them for a picture. Tourist has tomatoes poured on her head for a photo. One of the most popular photo opportunities is to run and slide on your chest while your pic is taken. A soldier has fallen. He fought a good battle. 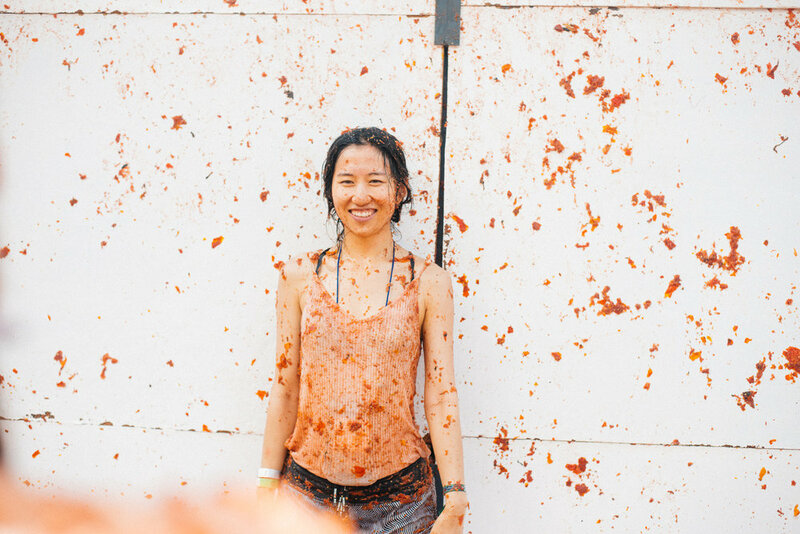 Chinese soldier celebrates surviving the Tomatina. Her shirt is white. Or at least it was. Girl heads to a faucet to get cleaned up while the shirtless man on the right tries to kick everyone out of his sidewalk so he can go back to his normal clean tomatoless life. I was covered in tomato goo. My hair was like dried up spaghetti. My camera straps and my waterproof canoeing backpack were (and still are) red. There are no public showers, but no worries, there are dozens of locals that hose you down. Some charge 2 euro to clean up. There was even one lady that offered soap. If you walk far enough from the “red zone” you can even find some good souls that will help you clean up for free. I just went to my car, dropped off my gear, and went to a public fountain and untomatoed myself. My hair was surprisingly smooth. For two euros you can get hosed down with freezing cold water. This lady even threw in some shampoo for free. Or you can bum some free water in a public fountain like I did. This place was blasting loud music and selling beer as well as hosing down tomatoes. Doesn't matter how hot it is, the freezing water is still uncomfortable. The number one absolute most important thing you need when you shoot under tomato heavy conditions are PAPER WIPES. That's right. It doesn't matter how much you protect your gear against water and acid if you don't have a clean lens, you're photos aren't going to be clear. I learned that from the veteran shooters there, who had kleenexes individually packed in tiny plastic ziplocks. Tomatoes are slimy and acidic and are not easy to clean from your filter. I wrapped my cameras in plastic wrap and gaff taped it shut so it was completely sealed from fluids. You won't have access to your command dials, forget about changing settings. As I knew the sun would be strong, I set a shutter speed to around 1000. I left the aperture at 5.6 so I could have a larger depth of field and have more stuff in focus. I set the ISO to auto, which worked pretty well. I shot with a Nikon D5 with a 14mm-24mm, which I had to leave the lens exposed, and a Nikon D800 with a 50mm, which I left only the UV filter exposed. Many of the veteran photographers used this same technique, while others used one of those cheap plastic water proof cases for SLRs. That seems to be the best solution, as it has its own strap and keeps 100% of the camera protected, even the lens. I had one unforeseen issue. The day was insanely hot, there were 22 thousand people around me and there were tomatoes everywhere, so humidity was very high. While I was being pressed agains sweaty wet bodies (it's worse than it sounds), my lenses fogged from the inside. You can see in some pictures above there is a soft spot in the center of the photo. That's the fog. My lenses are ok now, the humidity evaporated and no permanent damage was caused. Keeping the camera up in the air as far away as possible from warm humid bodies would have prevented that. Next time, if there is a next time, I'll take only one camera and I'll get one of these cheap cases.